these colors have been on serious repeat in my mind, in my closet, and on my body 🙂 I have a very deep love for the color navy and within the past year burgundy has grown to become one of my very favorite colors too. thank you so much for reading! have a fabulous weekend! aaaaannndddd just for fun, I thought we’d have a little giveaway 🙂 it’s nothing too major 😉 but I definitely love this polish … “Come Here” it’s a red / coral shade and I have worn it a ton over the summer. .the ‘LLD’ .. little leopard dress. I was going to say the black knee high boots with the burgundy vest and blue and white shirt because its so equestrian but… This look is my favorite! 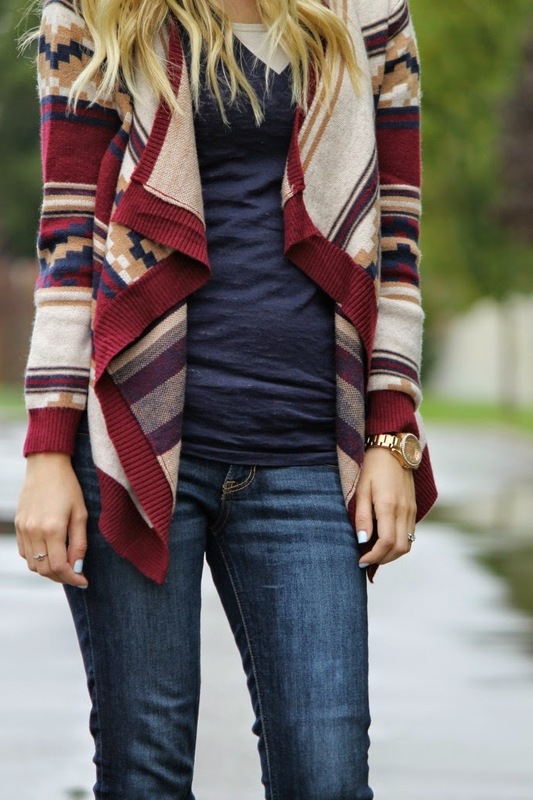 The tribal and cosy is casual but still adorable. And I have been loving the ankle booties lately, of course since fall is just beginning. I love anything tribal so this sweater is my favorite this week! & i love booties! They are the perfect fall accessory!